Andrea Palladio (1508-1580) has inspired, influenced, transfixed and transfigured Western architecture more than any other architect. One of his villas, the exquisite Villa Cornaro near Padua, is considered one of the ten most important and influential buildings in the world. 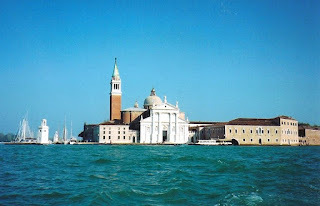 I’ve been an admirer of Palladio since my first visit to Venice—and encountering the sight of the shimmering white façade of San Giorgio Maggiore basilica reflected in the waters of the bacino in the late afternoon sun. Palladio’s transcendent villas and ecclesiastical buildings were constructed during the High Renaissance in his native Veneto. Some were commissioned as summer houses by Venetian nobles, others were contracted as city palazzi by ambitious businessmen. Wealthy landowners in rich agricultural properties around Vicenza and Bassano del Grappa puffed themselves up by siting their villas in positions of honor on their land. 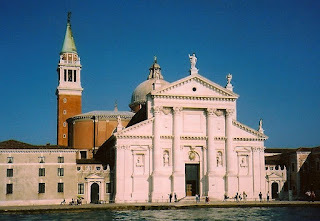 Palladio also designed two of the most ravishing churches in Venice. San Giorgio Maggiore floats in majesty on San Giorgio island. The Redentore on Giudecca was built as an appeasement and offering against the plague that had decimated the Venetian population in 1575. 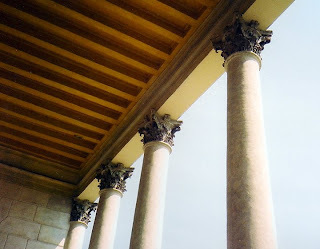 The balance, harmony, symmetrical proportions and timeless elegance of classical Greek and Roman architecture (his ideals were the Pantheon and the Acropolis, for example) are clearly visible in his most famous villas, La Rotonda, Villa Foscari, Villa Emo, Villa Barbaro, and Villa Cornaro. These villas, in turn influenced Thomas Jefferson and Monticello and the greatest English country houses (Chatsworth, Blenhein Palace). When in Venice recently, I took a day trip to Piombino Dese to view Villa Cornaro, considered one of Palladio’s masterworks. It is the spring and autumn residence of Mr. and Mrs. Carl Gable of Atlanta, the sixth family to occupy the villa in its 453-year history. 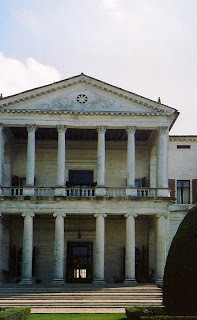 The two-story projecting portico-loggia of the Villa Cornaro. The first surprise at the Villa Cornaro is that it is in a small town, and is visible just beyond a tall brick fence. Most villas (like Villa Rotunda or Villa Barbaro) stand in a groomed and verdant landscape. Villa Cornaro is a townhouse. As the Gables generously gave a tour, the history of the villa unfolded. 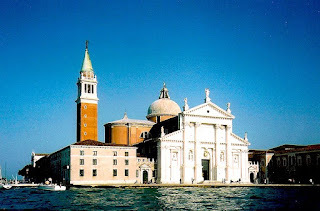 It was constructed in 1552-1554 as a retreat for Giorgio Cornaro, a Venetian noble. 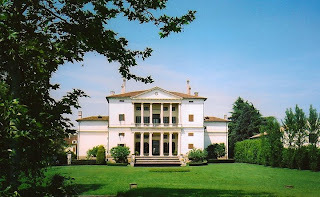 Villa Cornaro remained in the Cornaro family for more than 253 years. (Among the family pantheon was Caterina Cornaro, Queen of Cyprus.) After passing through the hands of three families, the villa was used as a parochial kindergarten in the fifties and sixties, until it was acquired by Mr. and Mrs. Richard Rush of Greenwich, Connecticut. The couple restored the villa over two decades. superbly maintained by the Gable family. Back in Venice, I made my usual pilgrimage to the Cirpriani for lunch (the sight of super-luxe jeweler Attilio Codognato swimming laps in the hotel pool is one of my favorite Venice sights). Taking the Cipriani launch across the bacino is a timeless experience, but the most remarkable part of the trip soon looms into view. Palladio's noble San Giorgio Maggiore viewed from the Cipriani launch. The portico on the façade of San Giorgio Maggiore, unlike the Villa Cornaro, is an illusion, created with a series of graphic pilasters and columns which come into brilliant view as the launch chops across the water, passing the Punta della Dogana and offering views of the Redentore over to the right and the hidden entrance of the Cini Foundation to the left. Photographs of Villa Cornaro in Piombino Dese, and San Giorgio Maggiore church in Venice, were shot in May 2009, by Diane Dorrans Saeks. Great pictures and superb commentary. Reading it was like being there with you. 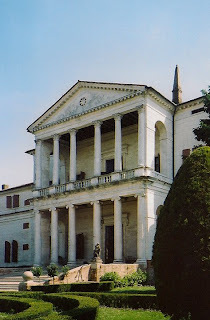 The end of May, early June, is the perfect time to go chasing Palladio around the Veneto! But...on the other time, any time in Venice is time well-spent. Regarding San Giorgio Maggiore church (pictured in my shots there) I always find it fascinating, ethereal, timeless, iconic. I like to watch it in all lights, all seasons. Two favorite vantage points: the roof deck of the Danieli hotel, and the Cipriani launch, coming and going to lunch or drinks. That façade (Villa Cornaro) is ravishing. What bliss it would be to sit on that balcony all day, lazily reading. The upper levels of the portico of Villa Cornaro are indeed conducive to reading, gazing over the landscape, dreaming, and perhaps nibbling white peaches, with a sip of Prosecco. I was incredibly fortunate to be able to be guided around the Villa Cornaro by the Gables, who have devoted years to the villa, and are completely besotted with it. As a visitor walks around the interior, Mr Gable notes the statuary, the didactic murals with discrete freemasonry symbols, and tells anecdotes of Cornaro ancestors, including a Queen of Cyprus. Few Palladian villas are private, with beds and desks and fresh flowers, enjoyed daily by the owners. Most (like many chateaux in France) are owned by a municipality or the state. At Palazzo Brandolini in Venice, or the Chateaux de Villandry or Vaux-le-Vicomte in France, the private owners keep the interiors alive, spirited and connected to centuries of history. Villa Cornaro offers this unique experience--with running commentary on Palladio and successive owners by the house-proud Gables. Being a fan of Palladio I highly recommend a stop in Vicenza if you have not been there before. 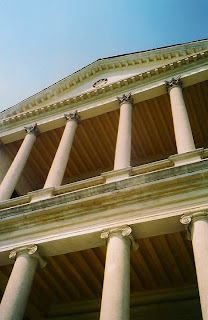 Amazing Palladian architecture. And, if it is still there, the best little family place to eat right in the main square. I love your coments about Palladio, Venice and the beautiful Villa Cornaro at Piombino Dese, not far from Venice, which my husband purchased from the Italian Government in 1969 and which we restored and furished over a period of twenty years. 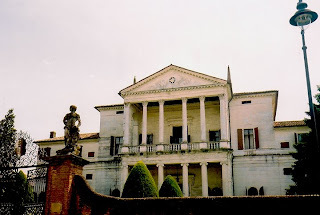 We are delighted with the new owners, who have opened the villa to the public as we did and who have promoted Palladio in lecures and in excellent web pages and Carl Gable is now President of the Palladio Society of America. Perhaps you read our unpublished story of the purchase and restoration of the villa and the 1989 sale to Carl Gable on our web page about my husband's latest book, "Collector Cars, Classics for the New Century," which features the Villa Cornaro on the cover as a great classic along with my husband's Lamborghini Miura. I walk through the villa each day in my memory...it was truly a great experience to have lived there. I see Palladio's influence almost everywhere... from Monticello to the WhiteHouse, to Drayton Hall to southern mansions and even buildings at Harvard and Dartmouth and other colleges and universities, public buildings, museums, and even many modern buildings. and in several of the homes we have owned ...and I know the Gables and their family are enjoying the villa now...and they keep it beautifully... and they fit into the town very well. We have a small exhibit of Palladio with books(many of which have the Villa Cornaro on the cover) and pictures of the Villa Cornaro and a model of it and some of our Italain art and antiques celebrating Palladio's 500th birthday at the Richard H Rush Library at the Edison State College in Fort Myers, Florida where we are living now. Thank you so much for your kind and informative comment. I do appreciate this information--and background. I was aware of the work your family had done to rescue the villa--I know it was sadly neglected when you took possession. Thank you so much for the beautiful and perfect and hard work you applied for so many years--and paved the way for the Gables in both the villa and the town itself and among the very eagle-eyed Palladio community. I am so happy to hear from you--and to round out the report for th villa's history, and yours.